Ideal for mobile workers, this USB-C multiport adapter with HDMI and VGA gives you flexible video output. 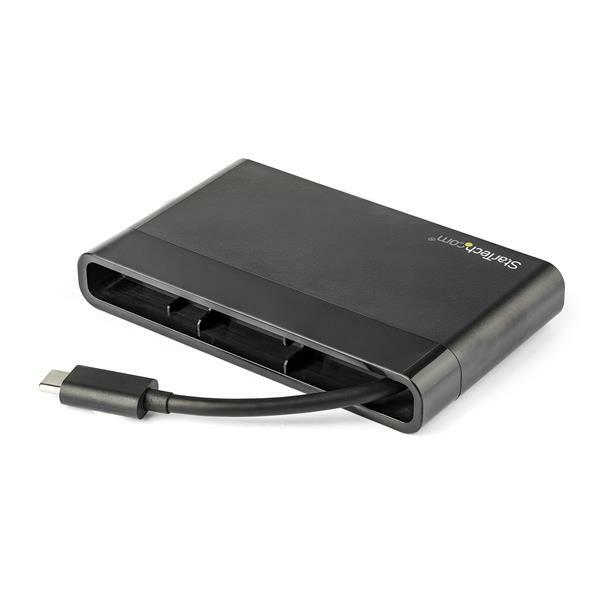 It’s like four adapters in one, with HDMI or VGA connections, a Gigabit Ethernet port and a USB 3.0 port, all through one connection to your laptop’s USB-C port. 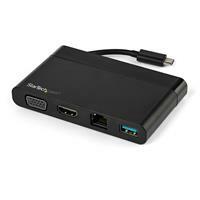 Plus, it features a hideaway cable for better cable management and easier travel. With easy plug-and-play installation on most operating systems, the USB-C adapter doesn’t require additional drivers or software. It’s the perfect accessory for MacBook Pro, Dell XPS, Chromebook or other USB-C laptops. The USB Type-C multiport adapter keeps you prepared for business travel. You can extend your laptop’s display by connecting to a 4K HDMI (4096x2160 or 3840 x 2160p) or VGA (1920 x 1200p) monitor or projector, to make presentations or set up a workstation. With multiple ports and an easily accessible hideaway cable, the USB-C all-in-one adapter makes an ideal travel dock, for easy connections on the go. Plus, the USB Type-C adapter is bus powered, so there’s no need to carry around a separate power adapter. 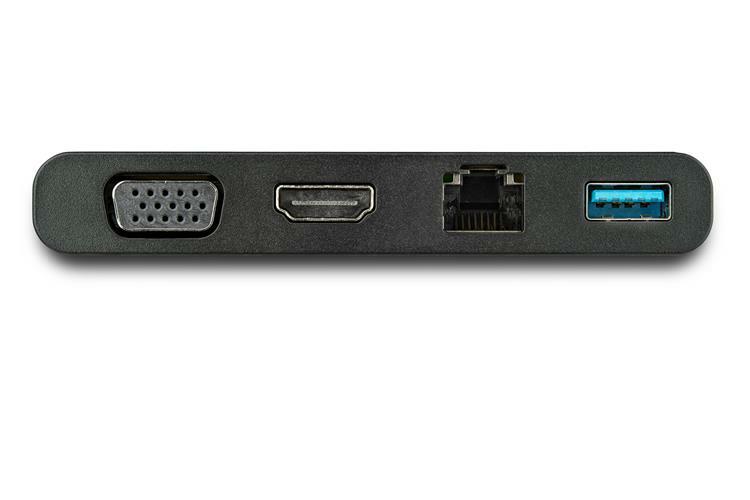 Connect a flash drive, mouse or other peripheral to your USB-C or Thunderbolt 3 laptop using the USB 3.0 Type-A port. The USB-C adapter adds wired network connectivity with the GbE port, making it ideal in areas without Wi-Fi. Note Not all USB-C ports support the full functionality of the USB Type-C standard. Ensure that your laptop USB-C port supports DP alt mode. System and Cable Requirements Host laptop with an available USB-C port (to ensure full functionality, the laptop's USB-C port must support DP alt mode).